Fears have been raised that a new CCTV surveillance system in Scotland’s largest city could become a ‘digital dragnet’ that threatens civil liberties, unless stronger legal safeguards are put in place. The sophisticated £1.2m surveillance software forms part of a £12.6m upgrade to the city’s public space CCTV system. But civil liberty groups have expressed concern that the authorities will be able to track a person’s every movement, without proper judicial oversight. A heavily redacted report published today by The Ferret reveals the real world capabilities of the new camera software, and how individuals can be tracked as they move around. The Ferret can also disclose that neither the Scottish Government, Police Scotland, nor Glasgow City Council, hold any written legal guidance that sets out how the system can be used. Council officials confirmed that guidance outlining rules for CCTV camera operatives is still to be updated. Although the full system is not yet in routine operation, the fact that officials have failed to set out new guidance for surveillance, has sparked demands for a ‘full and proper public debate’ from civil liberties groups, ahead of the cameras being used. The high-tech system is able to assign a unique ‘signature’ to each person who walks past a camera, in real time, and can then track their movements through the city. The software works even if areas covered by cameras do not overlap. The results can be presented to officials as a map, showing where a target had moved throughout the city. Camera operators can start searches for people by uploading a photograph of the person they wish to find. Alternatively they can even build an ‘avatar’ of their “target”, based on a description of their clothes and physical characteristics. In trials, the report said visual analytic software called Suspect Search was able to track people successfully, even in busy streets with hundreds of people walking past. A promotional film produced by the developers of the Suspect Search software, NICE systems, illustrates how the system works. As well as tracking the movements of people, other software modules supplied by the firm can trigger alerts to camera operators if crowds gather unexpectedly, or when people enter areas defined by the camera operators. One of the first tests carried out was to see if the system could automatically spot people putting a traffic cone on the Duke of Wellington statue in the city centre. It could. However, Pol Clementsmith of Open Rights Group (ORG) Scotland said: “We have some grave concerns about the potential snooping capabilities of these new über high-tech cameras. “Not only can these cameras be set to automatically trace and follow an individual, they also have capabilities which go far beyond the weak statutory regulations which govern their use. “These cameras can now pick out an individual from a crowd – yes, that’s you or me. “Putting this much power in a few lightly regulated hands is tantamount to saying that it is fine for the authorities to track our every movement, without proper judicial oversight, anywhere and any time they feel like it. Clementsmith highlighted the future risks. “Today they might just be keeping a benevolent eye on those kids who think they’re Banksy but tomorrow they could be monitoring our every move, from the moment we pull the front door behind us to the minute we’re safely back inside the house,” he said. “This is not the kind of world we want to find ourselves living in and if we are not careful we will find ourselves sleepwalking into a surveillance state. Richard Haley, of Scotland Against Criminalising Communities, echoed concerns that the tracking ability of the software could be abused by camera operators. In his view, any capability that allowed individuals to be tracked through the city should only be used with the authorisation of senior law enforcement staff, under the Regulation of Investigatory Powers (Scotland) Act (RIPSA). He said: “CCTV systems can legally be used very freely in public spaces, provided they are only used for general observation. “On the other hand, if a CCTV system gathers private information about a targeted individual without their knowledge, it is considered in law to be engaged in “directed surveillance” and authorisation for each such surveillance operation has to be authorised under RIPSA. Haley went on to explain that the same rules should also apply to the system when Police Scotland use the city CCTV cameras. The Ferret obtained figures which show that the Glasgow CCTV system has been controlled, or partially controlled, by Police Scotland 483 times over three years, equivalent to at least once in every three days. Haley added: “Guidance issued by Police Scotland sets out their procedures for authorising police use of covert CCTV for directed surveillance. But the guidance is written in general terms that do not explicitly acknowledge this sort of technology. Neither Police Scotland, nor a Glasgow City Council spokesperson would confirm that the new surveillance software would only be used to track Glaswegians when a Directed Surveillance Authorisation had been obtained. Liberal Democrat Justice spokeswoman Alison McInnes MSP said that the new technology posed a “real risk” to civil liberties and called for “urgent changes” to the law in Scotland to take account of the use of new technology. She said: “These technologies are new territory for public bodies. Without the right regulations, there is a real risk that our civil liberties become compromised. “We need to know what how this technology is being used, how long images will be stored for and, crucially, what steps will be taken to ensure that innocent people do not get caught up in this new digital dragnet. The council also confirmed that components of the visual analytics software have been phased into use since April 2015, but the Suspect Search capability was not yet operational. The story was also reported by the Daily Record. 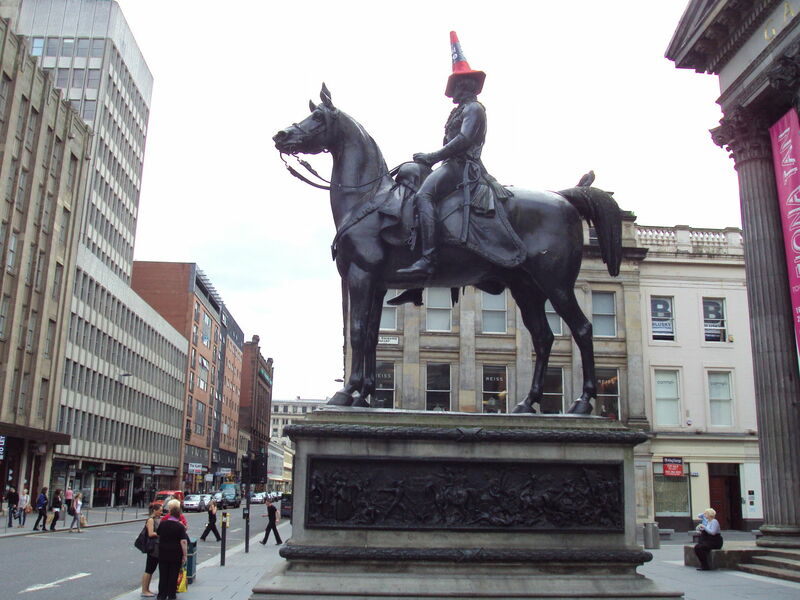 Header Photo: “Statue of Wellington, mounted, Glasgow – DSC06285” by Rept0n1x – Own work. Licensed under CC BY-SA 3.0 via Commons.